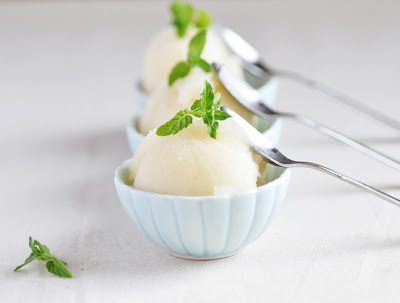 Homemade lemon sorbet is one of the recipes that surprises me by its simplicity: what, you can make that at home? What, it only needs two ingredients? No ice cream machine needed? I'm in! I have been part of a series of dinner parties and it was my turn to host a few days back (read about it here). I was the fourth one out of five. So imagine the pressure to top the other three dinner parties that had set the bar very high. Sorbet is a popular palate cleanser between courses of a big meal. I thought, it would add a nice surprise touch to my menu that we had to submit in advance. I experimented a bit with the proportions. My first batch turned out too sweet, the second one turned out to bitter (at that batch I was still adding lemon zest to the mixture). The recipe below turned out just perfect. Not too sweet, not too lemony, not too watery. A lovely refreshing lemon sorbet that's good enough to be served at dinner parties. And surely a welcome cooling anyday dessert for hot summer days. Make a simple syrup by heating sugar and water in a suacepan over medium heat until the sugar has completely dissolved. Remove from heat and let cool. Stir in lemon juice. Chill the mixture in the fridge until thoroughly cooled. Pour the lemon mixture into a shallow bowl or pan. Freeze until almost solid. Take out of the freezer, and thoroughly stir it with a fork. Put back into freezer and freeze until solid. Scoop out the frozen mixture and place it into a food processor. Pulse until smooth. Transfer sorbet to airtight container and return to freezer until ready to serve. Scoop into serving bowls. Garnish with fresh mint leaves. Serve immediately.